^ Only U.S. dependency to drive on the left. ^ Slawych, Diane. Love is in the air. CANOE.ca. [2008年1月25日]. （原始内容存档于2009年6月20日）. ^ Average Conditions Saint Thomas, VI. weather.com. [May 16, 2010]. （原始内容存档于2010-12-03）. ^ Office of the White House Press Secretary. Statement by the Press Secretary on S.J.Res. 33. 2010年6月30日 [2010年6月30日]. （原始内容存档于2010年7月15日）. 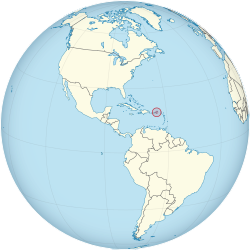 ^ USVI Constitutional Convention mandated to reconsider autonomous proposals. 维尔金日报. 2010年6月30日. 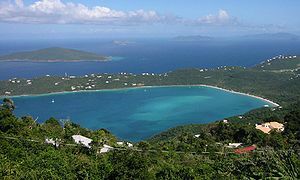 ^ Overseas Review, "US House Approves Political Status Education Bill"
^ Virgin Islands Tourist Tips. Here.VI Search. WebMastersVI.com. [2010年1月24日]. （原始内容存档于2009年2月10日）. ^ Official USPS Abbreviations. 美國郵政署. [2010年1月24日]. （原始内容存档于2009年3月28日）. 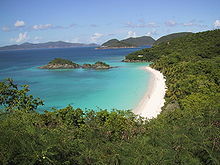 ^ Virgin Islands General Information. 美國郵政署. [2010年1月24日]. （原始内容存档于2009年12月25日）.